Welcome to the mid-September installment of the Tarot Blog Hop. The topic for this one is maintaining and restoring balance--ironic considering that I am just starting to warm-up to break out of my summer schedule (which is not balanced at all). A few years ago, while I was in college, I started to goof off during the summer months. At the time, it made sense--if only because I did not want to take classes during the summer semester (same amount of work--less time to do it in). After graduating (two bachelor degrees--literature and history), I continued taking the summer easy--mainly because of my wife's work habits and schedule. Being a schoolteacher, my wife takes the summers off and works on her pottery business. Now, this would not be so bad if she was not gifted with an annoying handicap--basically, she can't see when I am actually writing. I can be typing away, and she will walk into the room and proceed to talk as if my fingers flying over the keyboard are non-existent. One of the bad things about writing (and art, for that matter) is that it is a "flow" activity. Basically, it is easier to do (and often better quality) if you can enter a mindset where the words and images just flow though you. Interruptions leads one to having to hack the words out at a painful rate of one word at a time. Yes, writing is always done one word at a time. But when the space between two words become filled with other concerns (such as the fact that one is supposed to pay attention when your wife is talking to you), it becomes a war to convince the next word to show up in a timely manner. Allow enough interruptions to happen, and the next thing you know you haven't wrote anything since like--forever, and one's muse goes on strike. In my case, that is really not a good idea. I suffer from Heinlein Monkey--my health (both physical and mental) start to suffer when I haven't been doing enough writing. For instance, instead of sleeping, I will toss and turn for the entire night. And over the years, the problem has gotten worse. Under normal conditions, the most that I have to put up with the summer schedule is three months, plus weekends, school holidays, and any day that my wife decides to take off, and...well, my bad childhood programming kicks in whenever someone decides that their schedule, even if it is only goofing-off, matters more than whatever I am trying to do. And I will feel great guilt for the little voice in my head that says that I should be writing instead. Why do I have such bad programming? Simple, my mother thought that it was perfectly okay to make the oldest kid still at home, drop everything, including homework, to take care of the younger siblings and the house. That is why I ended up failing high school. Of course, it was not my mom's fault--according to her, I flunked high school because I was stupid--not because I was not allowed to do any homework. And any money I somehow made went 100% towards supporting my siblings. So basically, I am programmed to put everyone else in front of my needs and wants--and suffer crippling guilt when I do not have the time or resources to support someone else fully and absolutely. Hence my wife decides to take the day off, and I feel obligated to keep her company--which is followed by frustration that I am getting no work done, and guilt over the fact that I feel frustrated, topped with the feeling that I am supposed to be making money hand over foot without burning up any resources (time or money). Unfortunately, my mother-in-law died last year (suicide), so I never left summer schedule last year. My "summer" has now gone on for a year and a quarter. And it probably made sense to extend it to provide emotional support for my wife, but at some point you have to get back to work. Especially if not working has allowed an impressive imbalance to build up. How bad is this imbalance? Peeking at my Tarot deck, the top card is the Two of Swords and the bottom card is the Lovers. I will admit that I am not brave enough to actually draw any other cards. Besides, it is not like I am going to change my plan for restoring balance. 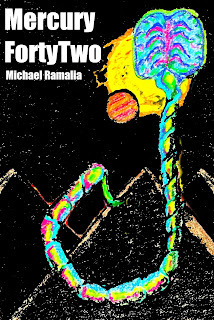 Mercury Forty-Two--this might be the final cover. Before my mother-in-law died, I was considering rebranding and relaunching my writing career. What I had planned originally was updating some books covers, writing and releasing some new stories, writing less political posts, stuff like that. The extended summer basically left me unable to do anything other than research how other writers were making money in the current market, and thinking about what my ideal work schedule would look like as a writer. I did take a swing at rebooting and returning to my regular schedule in December, but it all went sideways when the remodeling started. (Not that the Esoteric Comedy Show project was ever going to be profitable, especially after YouTube changed the rules about who got to run ads on their videos.) From late February to...well, the first of this month, I got no writing done beyond the odd blog post (far and inbetween) and spent my writing energies just outlining novels that someday I might write once my wife started to work a regular schedule. When my wife works a regular schedule, I get to work in peace while she is at work. Unfortunately (or fortunately, depending on how you choose to think about it), my wife had just quit her previous job when her mom died. After several years of dealing with bad charter school administration (that basically decided cheap was better than experienced), my wife was overdue to change jobs. And she was supposed to find a new job over the summer. That got tossed aside by family tragedy--she spent a lot of time dealing with her mom's estate. So she does not have a regular job yet (and I am guessing that it is going to be another whole year before she finds one); therefore, she is subbing again this year. The thought of this was making me go a little crazy. So crazy that I have been forced to create a set of new rules. It is just too bad that I keep breaking them. For instance, I was supposed to have a new Tarot card done for this post (and to illustrate a story that I am working on), and it did not get done--because I allowed myself to step away from the keyboard and drawing board this week to provide emotional support for my wife's first full week back at subbing. First, I have to write five hundred words a day. This number will go up later, but my writing engine is still cold as hell with the words coming at a painfully slow pace (three hours for five hundred words--not my best pace). And I need to write at the same time every day to increase the likelihood that my muse will get the memo and start showing up regularly. Most importantly, I am not allowed to step outside until my mandatory word count is done for the day. Second, after a project hits a certain word count, I am not allowed to switch projects in that category until the current one is done. I am splitting my writing between Occult and Science Fiction/Fantasy, so that means that I have two projects going at any one time. Any ideas for other stories are written down on index cards and put in the proper file. Fourth, I need to make sure that I am actually eating lunch. After twenty years in food service (most as the responsible employee) and my childhood, I have bad tendency to realize I am hungry, and then proceed to continue what I am doing without actually taking time out to eat. I have started to make my lunch for the next day at the same time that I am making my wife's lunch for the next day. It is a lot easier if I only have to walk to the fridge and back when the writing is flowing. Fifth, I am learning to write while wearing headphones. In theory, this is supposed to cut down on distractions and provide a visual clue that I am trying to work. Sixth, and most important, I am not allowed to chase the hottest money making scheme, nor am I allowed to hand over funds and resources that were earmarked for my own business. That includes my time and energy. Will these rules help? Yes, provided that I stick to them religiously. So that is my current plan to restore some balance in my life. I will let you know later if I actually stuck to the plan, or if I allowed myself to give into the guilt and voices that say that I am supposed to put everyone else first. WOW, Morgan, that's quite the tour through "writerdom". This writer is taking your story to heart and trying to get busy again myself. Thanks for the inspiration! Hi Morgan--I feel your pain. I'm a consultant which means sometimes I'm at a client's site and sometimes I'm home. And when I am home, my 26 year old daughter things nothing of opening the door and starting to talk to me even if I'm in the middle of something. Whenever I tell her I'm busy, she gets her feelings hurt. We're getting better, but it is still really annoying. Hoo boy, do I ever hear you on the talking spouse. I have a DO NOT DISTURB sign on my door that is working. It's a visual reminder to the Husband Unit that I am to be left alone. Good luck! Totally get that needing to stick to a schedule so that the muse will get the hint and show up. While I am trying to do that myself I will remember your post and know that I'm not alone. Thank you for sharing your plan and hope it works out for you! Read the soon-to-be-released novella Inside the Mind of Martin Mueller, by EA Luetkemeyer, to see how far one writer will go to have his own space.